DANIEL RATIU - talented boy, was born on 5th October 1996. With his family roots deep in Romania, the Ukraine, London and the North of England his life routes have taken him far and wide. In this, his first solo exhibition, "My Roots" you will see scenes from London, Transylvania, Danube Delta, France and Switzerland where his father was born; his experiences, real and imaginary scenes from his inner world - rich, bright and astonishingly mature. Through his pictures he is telling the story of his noble ancestry. His grandfather was a Romanian exile - Ion Ratiu - educated in Cambridge, who continued the family tradition of serving his native country. Daniel is not the first with an eye for art in his family. The Frost side of Daniel's English grandmother Elisabeth Pilkington of the glass family, started the famous Bristol gallery, Frost and Reed in the 19th century. Godfrey Pilkington, Daniel's great uncle, also ran his own prominent Piccadilly Gallery for half a century in London, so it is not surprising that Daniel naturally is artistic. Daniel began to amaze his teachers at school with his unusual artistic originality at the age of seven. Behind his public self of non-stop pranks, computer games, fun with his four year old brother Thomas and a gruelling daily schedule of homework in four languages, plus piano, violin, and his favourite saxophone, Daniel's art is a more private affair. In fact, the only reason his work has survived at all is thanks to a loving Mother - very well known Jewellery Designer Sasha Ratiu, who over the years retrieved whatever items she could salvage from the nursery floor. 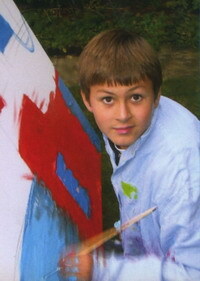 That was until recently when for the third year running Daniel won awards at the Russian Art competitions. We hope that you will enjoy Daniel's show and please do not hesitate to encourage him and other gifted young people like him to explore their own artistic talent and their own roots. A SHARE OF PROCEEDS FROM THE SALE OF DANIEL'S PICTURES WILL BE USED TO SET UP THE "DANNY FUND" TO PROVIDE MUCH NEEDED MATERIALS FOR TALENTED YOUNG ARTISTS.